It’s always a treat to find something created in Ceredigion. Ok, it’s not antique, but this well executed watercolour scene of New Quay by E Lilwen Lewis is rather good. 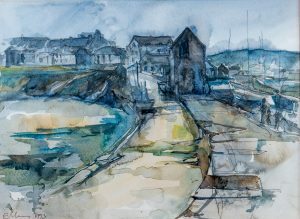 Lilwen still resides and paints in New Quay. She recently won 2016 Mike Dawes Trophy.